Holly Heck, a staff technologist at Mercy Orthopedic Associates’ bone health clinic, prepares Jenny Rhame, supervisor at the Breast Center, for a hip scan demonstration with a bone densitometer system. The clinic provides specialized care focusing on fall prevention and improving bone density. Mercy Regional Medical Center is aiming to reduce the number of broken bones osteoporosis patients suffer as the population ages. The National Orthopedic Association describes the 2 million osteoporosis-related fractures that happen each year as an emerging epidemic. The prevalence of osteoporosis, a chronic fragile bone condition, is expected to increase as the population ages. Pew Research Center estimates about 10,000 baby boomers will turn 65 each day through 2030. Mercy Orthopedic Associates’ fracture liaison service and its bone health clinic were founded about four years ago by Dr. Kimberly Furry to educate osteoporosis patients about their condition and prevent fractures and falls, said Clayton LaBaume, a physicians assistant and bone-health clinical coordinator. “It’s kind of like playing Russian roulette. If you have osteoporosis and you fall enough times, eventually you are going to break something,” he said. Similar bone health clinics have started across the country to improve care, and research shows patients who received care there had a reduced risk of additional fractures and increased bone density, according to Clinical Interventions in Aging. 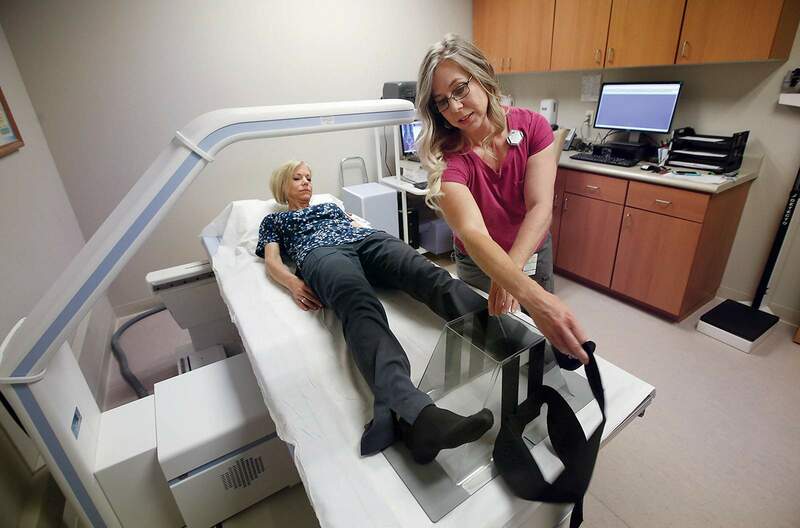 The Durango clinic was needed, in part, because the orthopedic doctors see so many patients with osteoporosis come in with preventable fractures, LaBaume said. 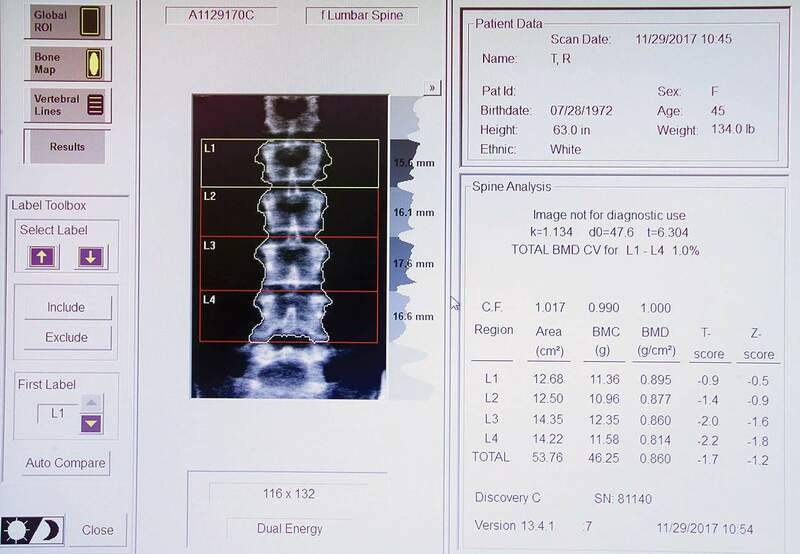 A patient’s spinal cord is seen after a scan with the bone densitometer system at the Mercy Orthopedic Associates’ bone health clinic. The clinic staff can provide more specialized care, while primary care doctors must focus on all the health conditions a patient is facing, he said. “Bone health and osteoporosis get put at the bottom of the priority list. ... That’s not a problem here, that’s a problem everywhere,” he said. About 2½ years ago, LaBaume spent half a day each week working with patients on their bone health, and now, he spends three-quarters of his time at the bone health clinic. It draws patients generally in their 60s and 70s from across the region, and this summer, it plans to start offering telehealth services to patients in Pagosa Springs, he said. Mercy also screens all the older adults who are admitted to the hospital with a broken bone for osteoporosis so they can be connected with the proper care right away, he said. 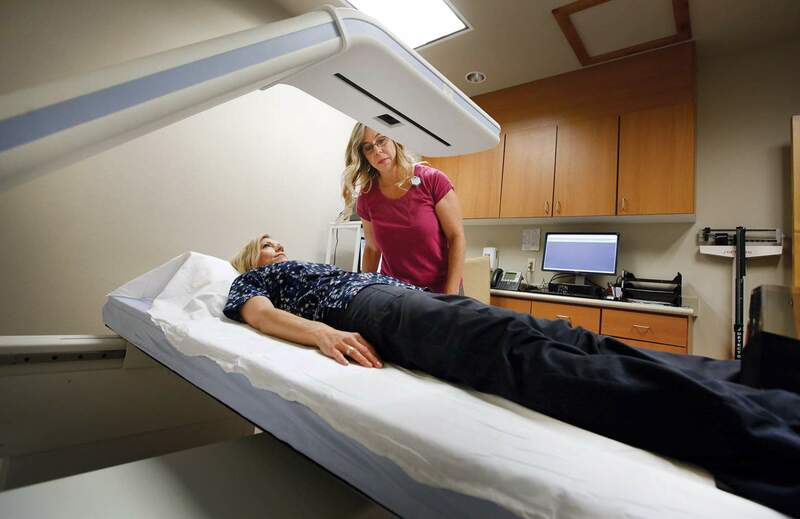 Preventing downward spiralTo assess patients, the bone clinic staff use a specialized X-ray machine to measure bone density, muscle mass and body fat. If a patient has fractured a bone from a standing height, they can also be diagnosed with osteoporosis, based on that alone, LaBaume said. Once someone with osteoporosis breaks a bone, they are twice as likely to break another one, he said. Among those who suffer a hip fracture, 20 to 24 percent die within a year, according to the International Osteoporosis Foundation. Holly Heck, a staff technologist at Mercy Orthopedic Associates’ bone health clinic, prepares Jenny Rhame, supervisor at the Breast Center, for hip scan demonstration with a bone densitometer system. The prevalence of the osteoporosis, a chronic fragile bone condition, is expected to increase as baby boomers age. Those with osteoporosis can face a downward spiral of increased fragility as they worry more about falling and become less active, which leads to a decline in muscle mass and bone density, said David Bruzzese, a spokesman for Mercy. LaBaume works with patients to regain bone density through their diet and by referring them to strength and balance classes. He tries to ensure patients get enough calcium and vitamin D and limit alcohol and caffeine. Treatment can increase a patient’s bone density, but it cannot eliminate the risk of fracture. “We consider stopping the progression of the disease to be successful,” LaBaume said. Tracking patient progressThe clinic doesn’t have data to share about how it has improved patient care yet, but as part of its fracture liaison service, it tracks patients who have had a fracture to ensure the clinic is improving post-fracture care, he said. The patients’ data is entered into a registry that is part of a national effort by the American Orthopedic Association to reduce the number of osteoporosis-related fractures. If patients know they are at risk for osteoporosis, they don’t need a referral from their doctor to visit the bone clinic, and the care is covered by insurance. The clinic would like to see patients before they break a bone and more and more of those people are coming in, he said. “I want to see people who are at high risk for osteoporosis who haven’t ever had a fracture because, with the right prevention, we can prevent the first fracture from ever happening,” he said.